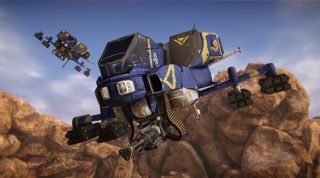 If you're looking to rack up some easy certs and EXP in PlanetSide 2, there are few more heroic ways to do than raining rockets down from your ESF (Empire-specific fighter) upon enemy Sunderers, tanks, and other wheeled/treaded bad guys. This video from Unit Lost will show you how to best kit out your aircraft for harassing ground assets that are different colors than you. It's shot from a TR perspective, so the weapon names will be a little different for the other factions, but the equipment suggestions overlap if you're flying a Scythe or a Reaver. Once you've mastered the art of air-to-ground strafing, you can try fancier maneuvers. This Vanu outfit that has been drilling the careful art of swapping from one vehicle to another in mid-air. Some attempts were more successful than others.